You can enter a perio exam in a patient's record. On the Perio tab of a patient's clinical record, click (or tap) New Perio Exam. The New Perio Exam dialog box appears. Select the desired options, such as the arch and tooth sequence and the teeth to be skipped. Date - Verify that the date is correct. If necessary, you can change it. Provider - Verify that the correct provider is associated with the exam. If necessary, select a different provider. Tooth navigation script - Select whether you want enter primarily pocket depths or gingival margin. 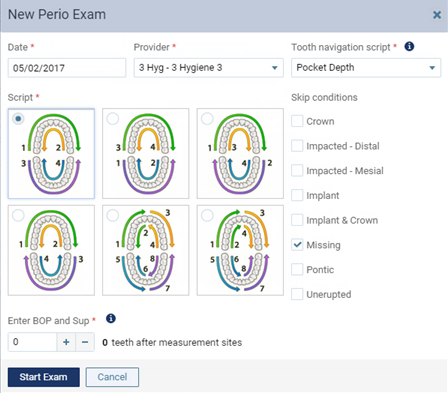 A selection frame will appear next to the specified measure (PD or GM) during the exam by default, but you can toggle between pocket depth to gingival margin as needed. Tip: To enter pocket depths first and then gingival margins, select Pocket Depth as the script, start the exam, enter pocket depths, save the exam, restart (or edit) the exam, select Gingival Margin as the script, enter gingival margins, and then save the exam. Or, you can enter gingival margins first and then pocket depths by making the script selections in the opposite order than just explained. Script - Select the method that you will use to move around the patient's mouth to take perio measurements. Skip conditions - Specify if any teeth will not get examined. Teeth with any of the selected conditions will be skipped automatically. Enter Bld and Sup [#] teeth after measurement sites - Enter the number of teeth that you must measure before you can start entering bleeding and suppuration (for example, if you enter four, you must enter measurements for Distal, Center, and Mesial on the Facial side of teeth one through four) unless you click (or tap) a different area of the exam than where the script starts. Zero indicates that you can start entering bleeding and suppuration immediately upon starting the exam. 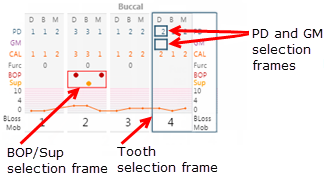 Also, as you follow the script to continue charting, the selection frame for BOP and Sup trails behind the current position by the specified number of teeth (as with our example of four, if the current position is tooth 10, the selection frame for BOP and Sup is on tooth six). Click (or tap) Start Exam. The options for entering a perio exam become available. By default, if the patient has a previous perio exam entered, the measurements (pocket depth, gingival margin, clinical attachment level, furcation grade, bone loss, and mobility) from that exam appear in gray. To switch between showing and hiding the previous exam's measurements, turn the Show prev. exam values switch On and Off. For each tooth, enter probing depths. As you type probing depths, the exam advances to each site and tooth automatically. You can also enter other periodontal measurements, such as gingival margin, bleeding, and suppuration. PD - Enter probing depths (0 to 19). Note: For measurements that are four or greater, a red box appears around the number on the chart. GM - Enter gingival margins (-19 to 19) in the M, C, and/or D boxes. BOP - If bleeding is present for any sites, click (or tap) the M, C, and/or D circles. To quickly add bleeding to multiple sites at once, click (or tap) the shortcut button or press the B key. Clicking (or tapping) the shortcut button or pressing the B key changes the applied bleeding and toggles between the bleeding options for that button: the empty circle removes the bleeding from M, C, and D, if any; the two half circles adds bleeding to M and D; the filled circle with an A adds bleeding to M,C, and D.
SUP - If suppuration is present for any sites, click (or tap) the M, C, and/or D circles. To quickly add suppuration to multiple sites at once, click (or tap) the shortcut button or press the S key. Clicking (or tapping) the shortcut button or pressing the S key changes the applied suppuration and toggles between the suppuration options for that button: the empty circle removes the suppuration from M, C, and D, if any; the two half circles adds suppuration to M and D; the filled circle with an A adds suppuration to M,C, and D.
Furc - Select furcation grades (F0 to F4). Furcation is not applicable to all tooth sites, so some sites do not have this option available. Bloss - Select amounts of bone loss (None to Severe). Mob - Select levels of mobility (None to Class III). 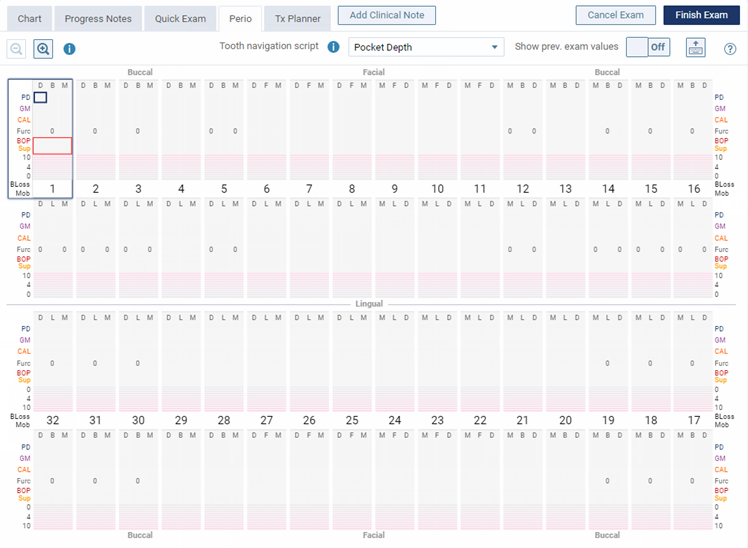 For pocket depths, gingival margins, and the other measurements, you can click (or tap) the left and right arrow buttons to rewind and advance the script for the exam. Click (or tap) an area on the graph to go directly to that part of the script for the exam. You can use the left and right arrow keys to move the selection frame for PD or GM left and right between the M C, and D sites. You can use the up and down arrow keys to move the selection frame for PD or GM up and down. With a site selected for PD or GM, to remove the value that you have entered, press the Delete key. After using the keyboard keys to stray from the script, to get back on script, click (or tap) the left or right arrow button. You can enter bleeding and suppuration separately from the script for the exam. Click (or tap) the left and right arrow buttons to go backward and forward sequentially between areas in the mouth. To enter bleeding and suppuration for an entire sextant at once, click (or tap) Mark Bleeding and Suppuration. By default, the tab of the sextant that corresponds to the tooth that is currently selected, but you can enter bleeding and suppuration on any tab as needed. 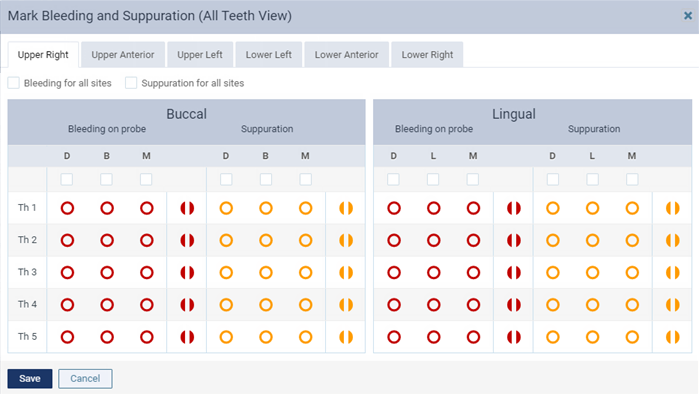 In a sextant, you can quickly specify bleeding and suppuration for all sites, for the same site on all teeth on the buccal or lingual sides, or on a tooth by tooth basis. When you are finished entering bleeding and suppuration, click (or tap) Save. You can use the number buttons or keyboard keys to enter probing depths and gingival margins. You can zoom in and out at any time during the exam either by holding down the Ctrl key and scrolling or by moving the Zoom slider between Full, Quad, and Tooth. The Full option is available only if the resolution of your computer's (or device's) display is high enough. To switch between hiding and showing the perio exam controls for entering data, click (or tap) the Hide and Show button . To view an explanation of all the abbreviations and symbols that are used for perio exams, click (or tap) the Legend button . When you have finished the exam, click (or tap) Finish Exam. If the patient has a previous exam, the Finish Perio Exam dialog box appears. If not, ignore the next step. 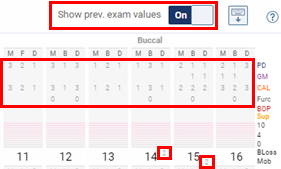 To save the current exam with measurements (if they exist) from the previous exam where you have not entered new measurements, click (or tap) Save Exam with the Previous Values. To save the current exam without any of the measurements from the previous exam, click (or tap) Save Only New Values. Why is the DCM box on the perio chart misaligned?